According to Ooyala’s newly released Q2 ’16 Global Video Index, mobile viewing now accounts for 50.6% of all video views, up a whopping 10x from the 5% viewing share on mobile in Q2 ’12. Ooyala has been tracking mobile viewing for years and this is the first time it has crossed the 50% mark. One year ago, in Q2 ’15, mobile was at 44% viewing share and two years ago, in Q2 ’14, it was just over 25%. Ooyala attributed the strong growth to the popularity of smartphones and robust WiFi, especially globally. 64% of American adults now own a smartphone and 90% of millennials reported they’re almost never without them. 75% of viewers age 18-29 watch video on their smartphone. Ooyala has released its Q4 ’15 Global Video Index, finding that mobile video now accounts for 46% of views. That’s up slightly from the 45% Ooyala reported in Q3 ’15 and 44% it reported in Q2 ’15, suggesting that mobile viewing share may be starting to plateau. Smartphones still dominate mobile viewing, driving 6x the share of tablets. For the second quarter in a row, 69% of all videos watched on smartphones were under 10 minutes. GfK MRI has released results of a new study analyzing the amount of time nearly 6,000 smartphone users spend on different activities, finding that just 2% of time is spent watching video. Phone calls and texting are tied for first with 22% of time spent, followed by email and social media (both 10%). Overall GfK’s category of “Entertainment,” which includes web surfing, music, games, video, shopping and reading, accounted for 22% of time spent. Cisco has released its 10th annual Visual Networking Index, forecasting that video will account for 75% of global mobile data traffic by 2020, up from 55% in 2015. The U.S. is forecast to have the highest level of mobile video at 77% of mobile data traffic, a 49% annual growth rate from 2015. Globally, mobile data will account for 367 exabytes of data per year, an 8x increase from 44 exabytes in 2015. The growth is driven by an increase in the number of mobile users and smart mobile devices and plus faster network speeds. Cisco estimates that by 2020, 5.4 billion people, or 69% of the global population, will have mobile phones, eclipsing the 5.3 billion that have electricity and the 2.2 billion that have landlines. Ooyala has released its Q2 ’15 Global Video Index, once again highlighting the shift toward mobile video viewing. For Q2 ’15, Ooyala found that 44% of online video views occurred on mobile devices, up from 42% in Q1 ’15 and 27% in Q2 ’14. Ooyala forecasts mobile viewing will surpass 50% of online video views by the end of 2015 if not sooner. Vdopia’s “Chocolate” programmatic mobile video marketplace, which launched last October, has experienced a 172% increase in ad spend from Q1 ’15 to Q2 ’15. Vdopia said that Chocolate served 12 billion mobile video ad auctions per month in Q2, a 110% increase vs. Q1. Chocolate had a 97% increase from Q1 to Q2 in mobile web ad auctions and a 195% increase in mobile in-app ad auctions. Ooyala has released its Q1 '15 Video Index, and as with all of its recent reports, the headline is the surging growth of mobile video, whose share is now at 42% of online video views. 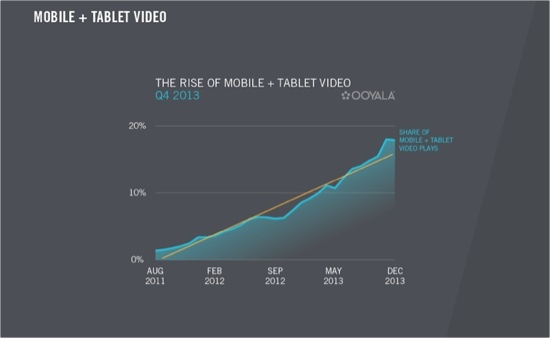 That's up nearly 5x from the 9% share mobile video recorded in Q1 '13. Ooyala restated its forecast that mobile video will surpass 50% of online video views in Q3 '15, if not sooner. No surprise, Ooyala cites smartphones as the big driver of mobile video usage, noting that the ratio of smartphone plays to tablet plays has increased from 2:1 in Q4 '13 to 4:1 in Q1 '15. In fact, tablet share has remained constant at 8% during that time. Ooyala cites the rise of larger screen size smartphones (particularly iPhone 6 and 6 Plus) as spurring mobile video adoption and stunting tablet viewing. Mobile video advertising is red-hot. According to Opera Mediaworks' new State of Mobile Advertising report, mobile video ad impressions in its network rose to 12.8% of all its impressions in Q1 '15, up from just 2.5% of all its impressions in Q1 '14. Mobile video advertising is also much more profitable than other formats, accounting for 55% of revenue delivered to publishers in Opera's ad network. Mobile video viewing will soar 13-fold over the next 5 years, to account for 72% of global mobile traffic by 2019, up from 55% in 2014, according to Cisco's new Visual Networking Index Global Mobile Data Traffic Forecast for 2014-2019. Video will increase at a compound annual growth rate of 66% over the period, the second fastest of any mobile application. Cisco forecasts that 17.4 exabytes out of the 24.3 exabytes that cross global mobile networks in 2019 will be video. Mobile video may be the hottest trend in video today, with evidence of its ascendance seemingly everywhere. As just one data point, last week's Q3 2014 Global Video Index from Ooyala pegged mobile video plays at 30% of all online video plays. That was up from 20% share in Q2 '14, more than double mobile video's 14% share from one year earlier in Q3 '13 and quintuple the 6% share from Q3 '12. That scorching growth prompted Ooyala to accelerate its forecast for when mobile video's share will cross the 50% threshold industry-wide. Ooyala previously saw this happening in 2016, but now believes it will occur by Q3 '15. Sandvine has released its latest Global Internet Phenomena Report based on data collected in March, 2014 across leading wired and mobile broadband networks. Focusing just on North America, Netflix once again dominates primetime usage, accounting for 34.9% of downstream bandwidth, more than the next 6 services combined. YouTube was second with 14.04% of bandwidth. It's a different story on mobile however, where YouTube remains the top downstream provider, eating up 19.75% of bandwidth, up from 17.7% a year ago, with Netflix in 5th place with just 4.51%. The usage pattern largely reflects the difference between Netflix's long-form content focus vs. YouTube's short-form focus. YouTube's CEO Susan Wojcicki recently disclosed that 50% of YouTube's usage is now on mobile. Multiscreen video ad campaigns running on Videology's platform in the U.S. in Q3 '14 surged to 35% of total campaigns, up 59% from the 22% share multiscreen campaigns had in Q2 '14. Multiscreen includes campaigns running either on PC/mobile or PC/mobile/connected TV. Video ad campaigns running solely on PC dropped from 74% in Q2 '14 to 60% in Q3 '14. BrightRoll has released a new study, conducted by Nielsen, which concludes that mobile video advertising provides cost-effective incremental reach to TV advertising. Nielsen found the following incremental reach with mobile video ads in 4 verticals it studied: CPG (12.7%), Auto (11.9%), Telecom (9.5%) and Financial Services (9.9%). Underlying the incremental reach benefit of mobile video is Nielsen's estimate that once a brand hits 60% or more of its target audience with TV advertising, there's a point of diminishing returns, making incremental reach very expensive. Nielsen has released its Q2 '14 Cross-Platform Report, finding among other things, that online video viewing/day for Americans age 18-64 has doubled from an average of over 13 minutes in Q2 '12 to an average of over 27 minutes in Q2 '14. The 18-34 age group leads with 35 minutes/day in Q2 '14, followed by 35-49 year-olds (26 minutes/day) and 50-64 year-olds (19 minutes/day). Despite the gains, TV viewing still dwarfs online viewing, and held up pretty well over the 2 year period. For 18-34 year-olds, TV viewing in Q2 '14 was 4 hours, 17 minutes (a 10 minute decline since Q2 '12), for 35-49 year-olds it was 4 hours, 57 minutes (an 8 minute decline) and for 50-64 year-olds TV viewing was 6 hours, 12 minutes (a 5 minute increase). eMarketer is forecasting that mobile video advertising will nearly quadruple in size from $1.44 billion in 2014 to $5.44 billion in 2018. The forecast is part of eMarketer's new "US Mobile Video Advertising 2014" report which eMarketer is offering for exclusive, complimentary download to VideoNuze readers. At last week's VideoNuze Online Video Ad Summit, eMarketer's Principal Analyst David Hallerman previewed some of the data in his opening presentation. The session was video-recorded and will be available soon. In the meantime, Beet.tv interviewed David at the Ad Summit and I've embedded the video below. Ooyala released its Q4 2013 Global Video Index, finding an increase of 719% in video viewing on mobile devices and tablets since Q4 2011 and 160% since Q4 2012. In December, 2013, mobile and tablet viewing accounted for 26% of time played, up from 18% in October. Based on current growth rates, Ooyala forecasts that by the end of 2015, 37% of all video viewing will be on mobile devices and tablets, and by the end of 2016, it will amount to fully half of all viewing. Ooyala said that the proliferation of video-capable mobile devices and tablets, WiFi hotspots and new multi-screen services have led to rapid increases in mobile video usage. Somewhat surprisingly, more than half (53%) of mobile viewers’ time was spent watching video longer than 30 minutes in Q4, compared to 35% for tablet users. Additionally mobile video share of plays increased by 21% from Q3 to Q4 2013. Over half (52.4%) of pay-TV subscribers still don't know whether their provider offers an app that allows for tablet or smartphone-based viewing, according to Digitalsmiths' new Q4 '13 video trends report. The level is basically the same as the company's Q3 report. Just 21.6% of subscribers have downloaded their provider's app (up slightly from 19.6% in Q3), but almost 60% of those that have downloaded it use it either less than once per week or never.